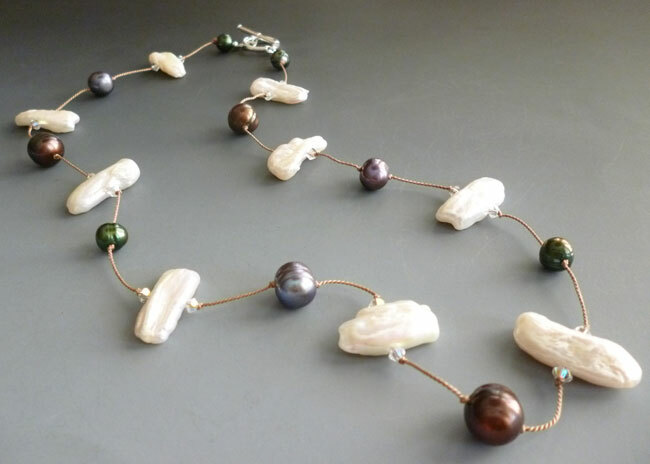 MiShel Designs: Yummy Pearls for Review! 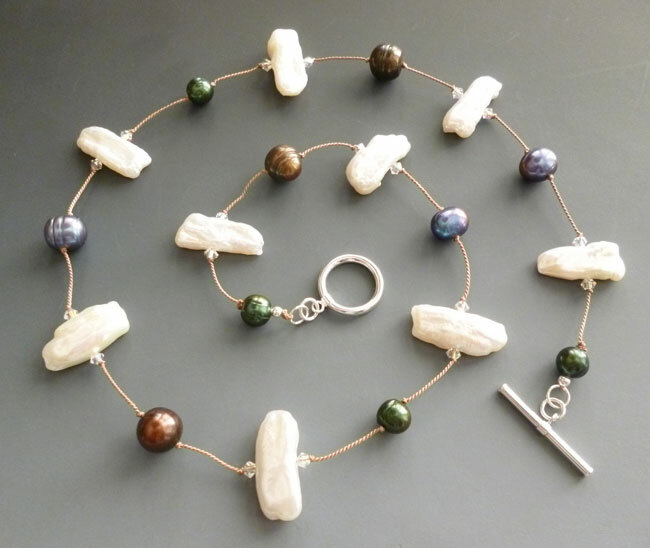 She sent this super yummy and delicious strand of freshwater cultured white stick pearls and once they arrived it was hard to stop drooling! 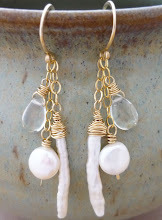 These beauties have a great luster and rose overtones (rainbow effect) and the nacre on them is very thick and clean. They're approximately 17 to 22 mm and their soft glow is superb! 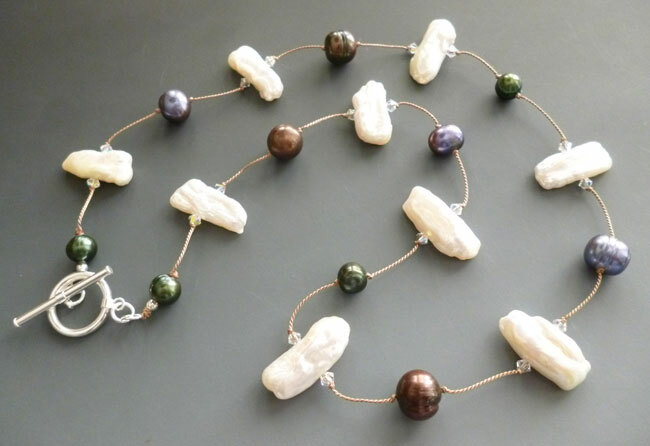 I thought these would be the perfect pearls to hand knot with some Swarovski Crystals and a few other freshwater cultured pearls to create a necklace that could be worn with jeans and a "T" or dressed up for a night out on the town! 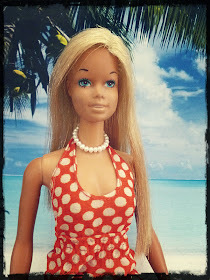 Here's what I created. What do you think? This particular necklace is being donated to put in a silent auction for a caner benefit being held this summer. 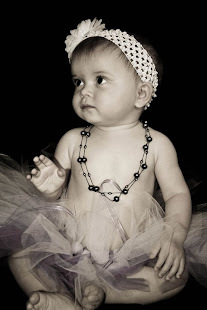 I think someone's going to feel really good wearing these pearls. First, knowing they've helped raise funds for a family in need and second, just because they're so darn beautful!! 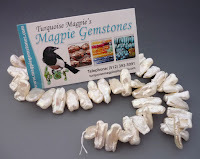 Thanks Szarka and Magpie Gemstones for allowing me to do this pearl review - your gemstones ROCK! Peace, Love and "Pearls Baby"
FTC compliance disclosure: the Magpie Gemstones items mentioned in this post were provided free of charge for review/design purpose only. 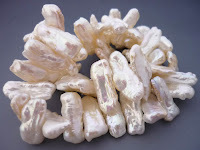 There's just something about stroking a bunch of pearls at a pearl vendor's table, isn't there??? ?